Enjoy an evening out listening to live music at our winery. Wine by the glass or bottle. & Microbrew PA beers will be served. Must be at least 21 years or older to attend this event. 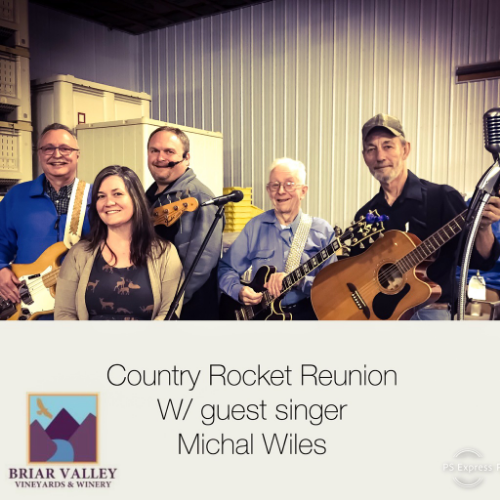 Come join us for a fun evening of music, The Country Rockets Reunion with lovely guest singer Michal Wiles. Bernard Rock is one of the original members of the band who was the opening act for many musicians back in his hay day. He’s played venues in Nashville, has put out records & has rubbed elbows with many in the business. Come & support one of our own. $10pp for case club members. Bring dinner, grab wine by the glass or bottle or have a nice cold Microbrew PA beer. Must be at least 21 years or older to attend.